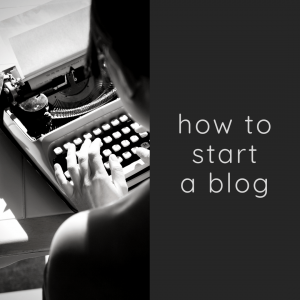 Everyone wants to start a blog even though few of us know where to begin. Wanting things is all well and good, but it amounts to little if we don’t have a plan. 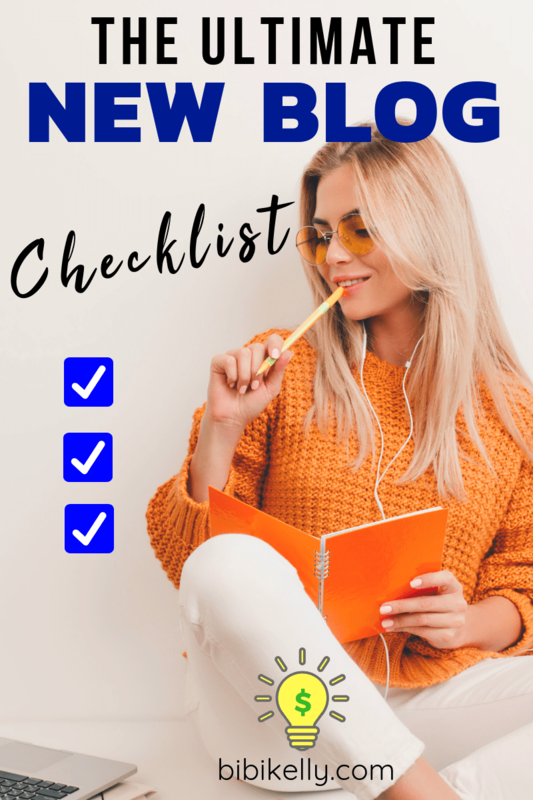 Figuring out what you need to start a blog is crucial to success, as haphazardly throwing things at the wall rarely results in anything more than a mess. With such a wealth of information on the topic, you should have no trouble finding some helpful hints on getting things up and running. That’s what we’ve got for you today. 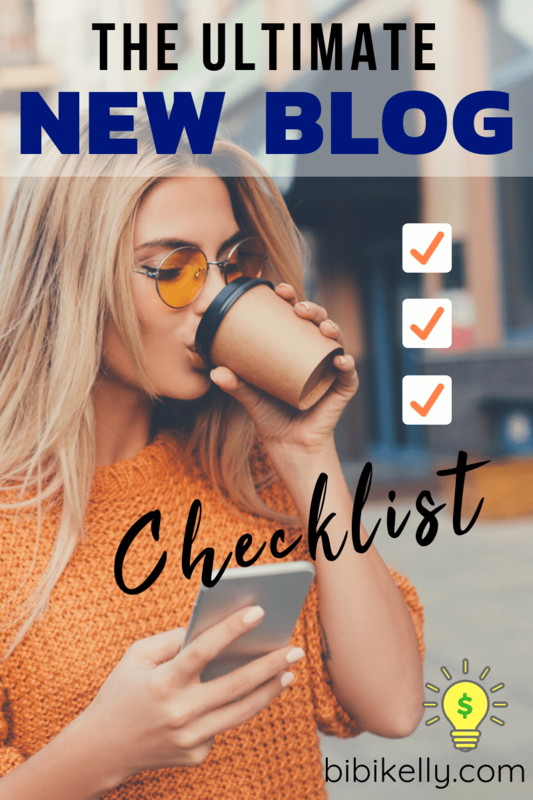 We’ve compiled a comprehensive new blog checklist with some of the best advice available for starting a new blog. It probably goes without saying, but the fundamental first step in creating a new blog is to figure out the topic you want to post about. There can’t be content if you don’t know what you’re supposed to be doing, right? Figure out what you want to do and stick with it. If you really have a desire to post about something else, just make a new blog for that interest (though if you’re only on your first blog, it’s probably a good idea to wait a bit before starting up a second). Feedback is essential to any kind of success. You need to learn about your potential audience's likes and dislikes, to craft the best blog possible. But where does feedback come from when you’ve barely even started? Other people’s blogs, of course. Taking a look at similar blogs around the web can give you some invaluable insight into what yours needs to do to succeed. You shouldn’t aim just to copy their content, instead, replicate their workflow. How do they get traffic? 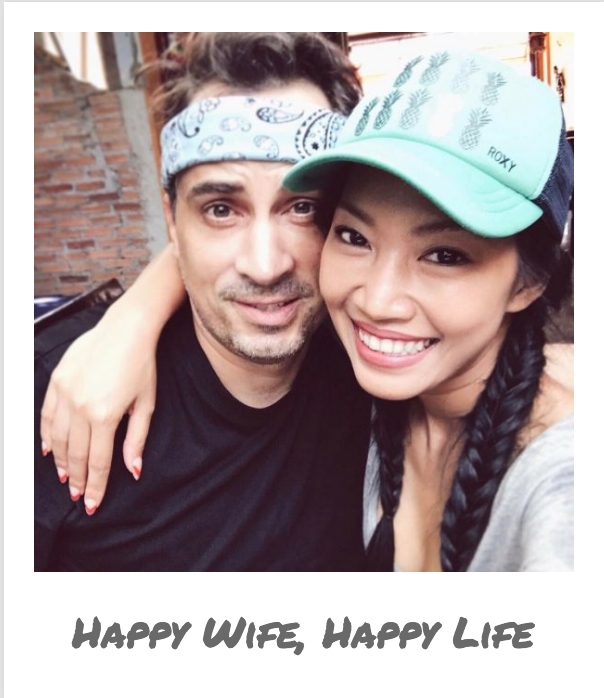 What kind of blog post titles do they use? What niches do they talk about a lot? There is no point in trying to be the same as others who are already more successful at what they do. ( i.e., your blog's personality) You need to be you, you need to be original. Instead, use the other successful bloggers in your niche as inspiration to see what kind of posts work, and don’t work and the type of web design and style others seem to like. With this background knowledge, you’ll have a leg up in your early days of blogging. It’s inadvisable to spend copious amounts of time worrying over things like a blog name. With that having been said, it’s still good to come up with a catchy name for your site to help attract visitors. There’s plenty of blogs and even major companies that have total nonsense for a title that still does perfectly fine. The key is making it easy to remember and recognizable. With that in mind, the perfect blog title would be something that’s not too long and easy to spell. You can’t expect people to search for you if they don’t even know what to type in. Finally, avoid any random key smashes or long strings of numbers. It not only looks unprofessional but can have a significant impact on your blog’s notoriety. If a blog’s title should be easy to spell, what do you think will happen if you include a bunch of incomprehensible numbers or letters for no good reason? It certainly won’t be an increase in traffic. Also, just do a quick search to make sure it’s not taken yet. There’s nothing worse than having to rename yourself after you just managed to get off the ground because someone else picked the name first. Lastly, pick a .com, you'll thank me later. You legally have to have these pages on your website, so quickly make them now. I give you permission to copy mine, just make sure to change the 'bibikelly' to your blog's name, etc. You don't have to have this page, but every legitimate website has one, so you should too. It's not hard to make, at the very least, put a basic contact page in place and improve on it later. This works as a starter. The first four pages aren't that important, but the About Page is the most important page on your website. Yes, the most important page. Pop Quiz: What is the 'About' page about? 99% of bloggers don't know the correct answer to this vital question. 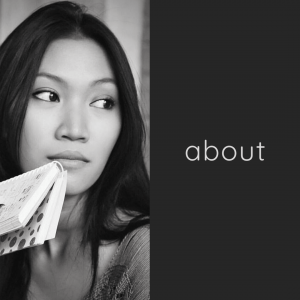 The About page isn't about you, it's about what your blog can do for the reader. Your About page is going to be your blog's first sales funnel. Your About page is going to be constant work in progress. Make it your masterpiece. Keep trying to make it look better and have more information on it as your blog grows. I'd recommend visiting it once every two months and try to improve it. A blog is a business. If you want to have a successful and profitable business, you need a plan. Trust me, you need a plan! How are you going to monetize your blog? What content are you going to create? What does your blog look like 1 year from now? If this seems a little overwhelming, start here. 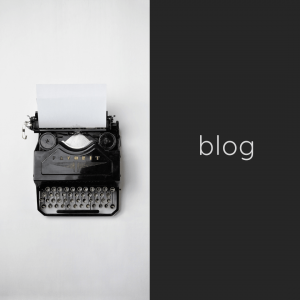 Similar to a title, a blog’s logo is essential for attracting and retaining visitors. Making a recognizable logo ensures people remember your brand as one they can trust, making it all the easier to get more engagement and interaction with your audience. There’s plenty of free and paid resources that can provide you with stunning logos, either from premade templates or otherwise. You could also contact an artist to create one for your, ensuring your design is entirely original and all your own as well as giving you an essential contact for more original art down the line. While a logo is even more important than a title in some sense, it’s still not worth expending tons of effort to produce. Getting caught up in overly fine-tuning a logo is energy better spent crafting original and engaging content. The usefulness of a good logo shouldn’t be understated, but it shouldn’t come at the expense of the rest of your blog. We generally make our own. Bibi has excellent design skills. Actually, let me save you a lot of pain. Install the Social Warfare plugin and have the best social share buttons on your blog right from Day 1. I've struggled with social share buttons since 2011 until I finally found these guys. Their free version works great if you don't want to upgrade right off the bat. I will tell you about the one really cool feature that sold me on the premium version. In every blog post's backend, you can set the exact Pinterest image that gets shared and the Pinterest description. This is a total game changer, trust me. See the image below showing you the backend of one of our blog posts. 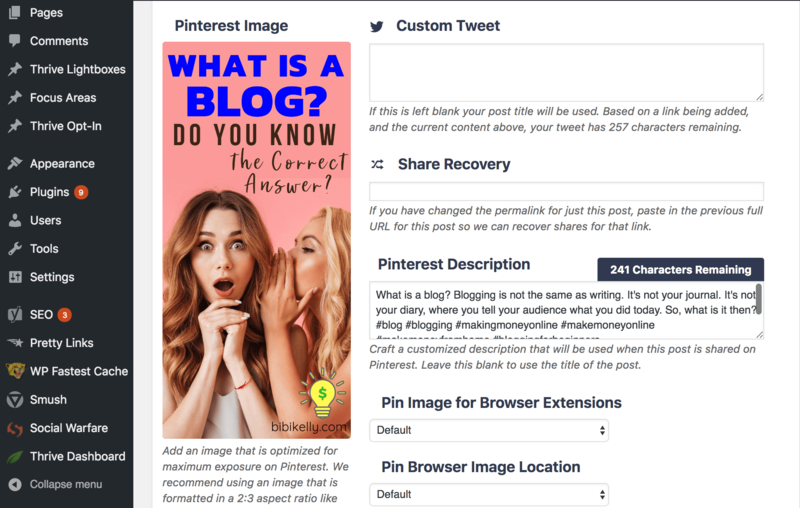 So when one of our readers shares this blog post, this is the image that gets shared, plus it also gets my custom Pin description filled with SEO keywords. While there are several reputable blogging platforms you can use for free, they don’t exactly scream professionalism. If you’re serious about making blogging into a career, the best investment you can make is to purchase your own domain name on a self-hosted platform. There are several advantages to having your own domain not beholden to the free blogging platforms, the biggest being brand recognition. Instead of just being yourblog.blogger.com, it's just yourblog.com. Not only that, you get total control over how your website functions. Various hosting platforms have different terms of service you need to follow and technical limitations with regards to how you can customize and monetize your blog. 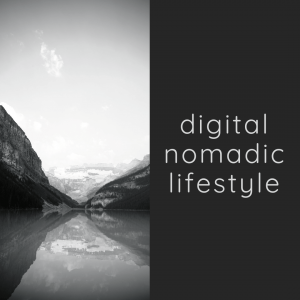 When you purchase your own domain, you can decide every aspect of your blog for yourself. When you buy a domain on a self-hosted platform, you own a digital asset. This is an important fact to realize. 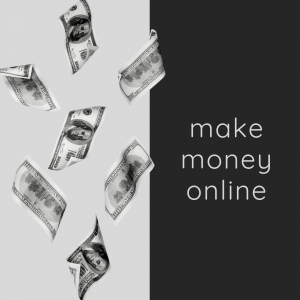 When your blog gets more prominent, and maybe life throws you a curve-ball, there are websites that will assist you in selling your blog for cold hard cash. This goes hand in hand with what we mentioned before about a domain. You’ve got that fancy new web space all for yourself now. Use it to the fullest and set up a new email address through it. The easiest way to do this is through GSuite. Not only does it look neat to others, but it’s also helpful for separating work and play. There’s nothing worse than replying to something important with 1337bicepdude @hotmail.com in the sender box. It’s also the best way to sign up for things necessary to running the blog or corresponding with clients. Not only does it make you seem like you know what you’re doing, but it also organizes all of these things into one location. Just like how your audience hates to hunt for content, you shouldn’t be forced to search five different inboxes for what you need. Free Alternative: Sign-up for a normal gmail account, i.e. your domain name @gmail.com. To post on your blog, you’ll logically need to make an admin account for yourself. This good security sense and opens up the possibility of bringing on other posters in the future. For safety, always use both a username and password that’s hard to crack. You’ve likely received plenty of tips on password security, but it’s far less likely you’ve considered doing the same with your username. Provided your site is set up in a way that allows you to display a different name from your username when posting (your name will appear on posts you make while you log in to the site with a different username), this is a great way to make it extra hard for anyone to bypass your security. The best way to do this is random letters and numbers, alternating capitalization, special characters, and anything else you can think of to make it even just a bit more incomprehensible. Use a password you've never used before, and don't use it again for anything other than your blog. We also recommend you to install this free plugin, Limit Login Attempts. There’s no use in posting anything if people aren’t able to read it. That’s where fonts come in and, while most would consider it an afterthought, they really can make or break a blog as you balance functionality with appearance. Font choice is a significant point here. You want a font that looks clean and professional while also keeping with the aesthetic of the rest of your work. Arial and Verdana are always good choices with the added benefit of being easy to read for dyslexics. Regarding color, just go with black. As for size, most recommend you stick somewhere around 15 points, though bigger is better within reason. This keeps things easy to read and won’t completely destroy the appearance of a letter when bolded or italicized. We use Montserrat, 16px height for paragraphs. We love it. Yes, if you want, you can copy us. Learn the backend of your WordPress website. Knowing how your website works is crucial to maintaining it. WordPress is an excellent content management system, you've picked a winner right from the get-go. There are lots of tools for fixing problems(called plugins), removing features you don’t need, and generally improving upon your blog's base design. If you’re struggling to do these things yourself, you could look for different plugins that help to streamline the process. My advice, in the beginning, worry less about design, more about great content creation. Please don't believe the 'blogging gurus', you don't have to produce daily content, nor do you have to a fixed schedule. If you vlog on YouTube, yes, you need a schedule. Yes, you need to produce regular content. For blogging, it is not that important. Think about what kind of content you’re going to make over the next couple of months. All the content that you are going to create should be part of a bigger picture. If you plan the create a course on How to Make Leather Wallets, then your blog content leading up to this course launch date should be related. i.e., How to Stitch a Leather Wallet and How to Pick the Best Leather to Make Wallets, etc. When you get down a few ideas, start to expand on them to see what actually holds up. Not only is this an effective way to plan things out, but it’s also great for ensuring the content that does get posted is top notch. Once you’ve got your ideas down, begin working through posts in batches, saving them as drafts or loading them into a queue. As you think of ideas, create a quick draft in WordPress, so you don't forget. My queue is super long. Ideas pop into my head all of the time, and when they do, I quickly make a draft in WordPress. I might not actually write the post for a few months, but the idea will always be there for later. Interlinking means to add links going to your previous posts into your new posts. I've done this throughout this very blog post. Linking to your content should be very easy to do because you've pre-planned your content and all your future posts are somewhat related to your old posts, right? Links in your content help to boost your blog’s position in search engine results, making it more likely you’ll be noticed by new people searching for a particular topic. Interlinks help to keep people on your blog for more extended periods of time and persuade them to read other articles. So long as the two topics are related, it’s fair game to interlink. Tracking statistics is vital. You'll want to install the Google Analytics script on your website. Get the code from Google, go here. If you use the Yoast SEO plugin, you can install the script directly into the plugin. The Yoast SEO plugin is also useful for enabling Pinterest Rich Pins. If you use the Yoast SEO plugin, they will automatically generate an XML sitemap for your website so you can skip this step. If not, download and install this plugin. After you install the plugin, go to Google Webmaster and register your website and XML sitemap. Not to sound like a broken record but...If you use the Yoast SEO plugin, you can install the script you get from Pinterest directly into the plugin. To stall the Rich Pin process, go to Pinterest, change your account to Business, and claim your website. Nobody likes a blog with no content. Dedicate the first few months to filling up your blog with epic posts. Aim to write 20 - 25 blog posts. There is no magic number, but after you have 25 blog posts, you most definitely can give yourself a pat on the back. The biggest mistake you can make when first starting your blog is not keeping track of things. There are innumerable benefits to having a detailed spreadsheet with all your numbers right at your fingertips. For one, it’s an easy way to keep track of financial gains and loses. What you’ve made through ads, sales, sponsorships and more versus the expenses related to your hosting service, plugins bought, products purchased, etc. 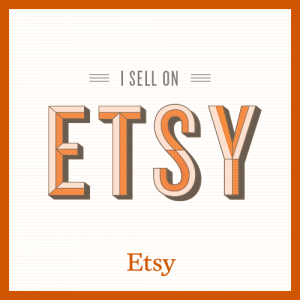 In simplest terms, it lets you know whether or not your blog is actually profitable. You should also be tracking your visitor statistics to see who’s actually reading your content, where they are, and when they do it. All of this gives you an idea as to what to shoot for when you post, helping to establish your niche in the blogging market. It’s also helpful to use this information to track what kinds of blogs perform best. If you know this, you can start making more content like that. You’ve also got a handy guide on which posts you could potentially interlink with each other by keeping track of what you write. No matter how much work you do to make your blog both run and look great, it won’t do any good if you don’t have any readers. It's time to promote your content! Social media accounts are the best way to accomplish this, especially new bloggers. Posting your content on places like Instagram or Pinterest is an effective way to reach a wide audience. Check out your analytics, too. These can provide an in-depth look at who’s visiting your blog to give a better idea as to where to focus the bulk of your advertisement. If your content really resonates almost exclusively with grannies, you might be wasting your time posting in skateboarding forums, for example. Networking is one of the most powerful tools in your arsenal when it comes to getting your blog up and running. Connecting with more established bloggers and content creators can give you a much-needed boost in views and net a ton of new followers just for being mentioned. Beyond just promoting yourself, though, getting to know these other successful creators pays off wildly all on its own. These people can be mentors and friends to you as you find your footing in the world of blogging. The more people you have in your corner, the better, so get out there and start making connections. You connect with these people using Facebook groups, Tailwind Tribes, Twitter and via Guest Posting. Whether it’s people in the comments below your first post or friends you’ve had read over things before they go live, feedback is integral to growing as a blogger. You need to be open to criticism and willing to learn from your mistakes or you won’t be going anywhere online. Listen to what people have to say about the things you make. If more of your readers just couldn’t care less about a specific type of post with low reader statistics to back it up, maybe don’t make many of those posts anymore. Most importantly, you need to develop a sense of discerning constructive criticism from pointless hate. Bending to the whims of everyone who comments isn’t good, but neither is stubbornly refusing to change anything. Figure out what real criticism looks like (there’s plenty of guides for that across the internet) and put into action the most common and reasonable complaints you’re getting. If you’re blogging as a job rather than just to have fun, running Google Adsense ads is one possible way to monetize your content. Programs like AdSense give you a quick and easy way to get ads displayed on your webpage with little to no effort on your part. Don't apply for Google Adsense until you have at least 25 articles on your blog. As with anything, don’t go overboard. Unobtrusive ads on the sides of a page or in the body of a post to strategically break up the text are fine, but people have no patience for blogs that are only loaded with ads. While there’s no science to how to run the perfect blog, these tips should be able to get you pretty close. 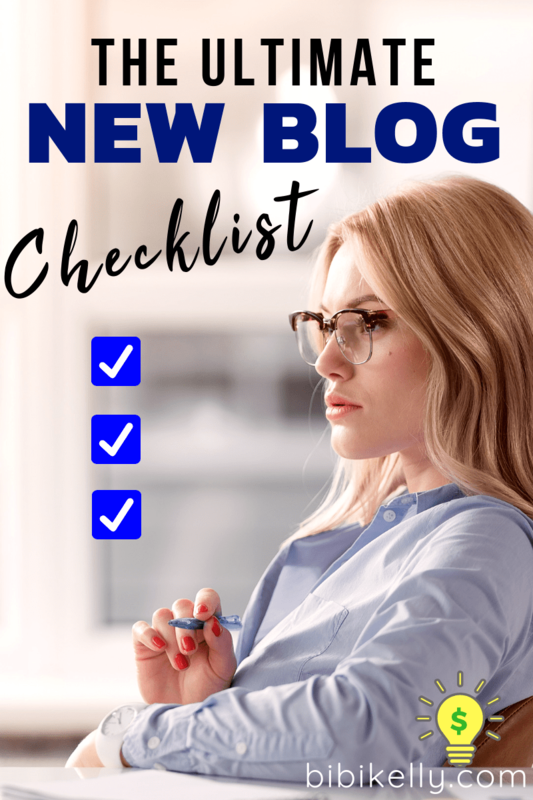 No matter what you intend to post about or what you plan to do with your success, this new blog checklist is the blogging resource you can use to ensure you’ve covered all your bases. Now get out there and start blogging like a professional.